Using the same parchment paper over and over again is eco-friendly. Well, duh, you’re not wasting paper after one use – it’s all about use, reuse, and recycle baby. However, regular parchment paper is not made for multiple use. 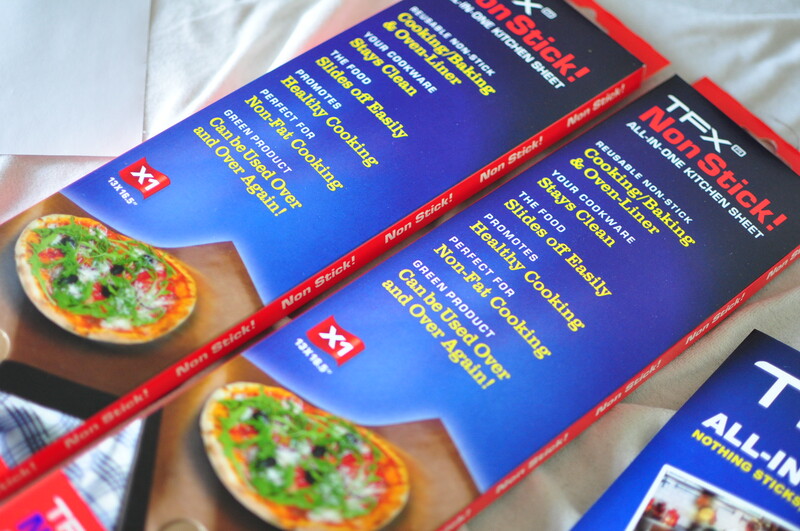 So I got pretty excited when I got to try out this new product, a nonstick kitchen sheet which replaces parchment paper and foils and can be used over and over again. 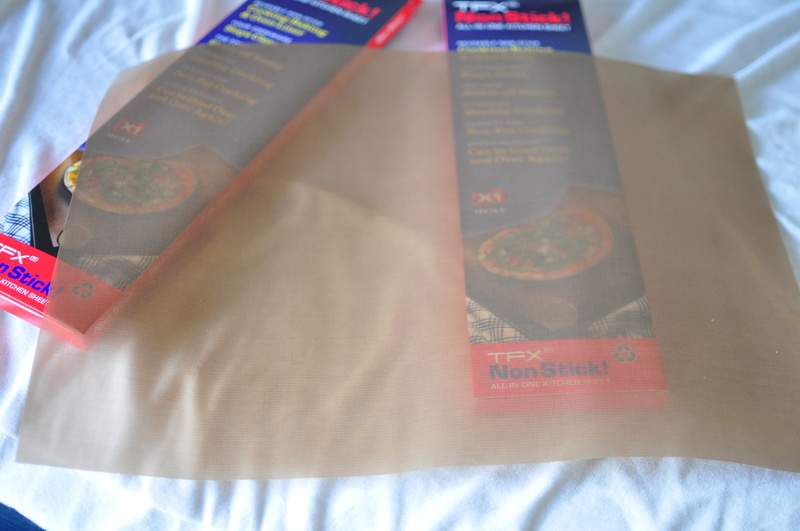 TFX NonStick All-in-One Kitchen Sheet was created to promote healthy cooking by eliminating the need for butter, oil, and non stick sprays for cooking, as well as being friendly to the environment by allowing for multiple use. In fact, the sheet is able to be used over a 1000 times without sacrificing the quality of baked good. This minimizes landfill waste. The sheet also is dishwasher and microwave safe and easy to clean, it transfers no taste or smell to the baked good, and it improves the presentation of baked goods. And interesting thing about this product is the fact that they are able to be cut up into desired shapes and sizes as well as being molded to fit any container. While it is perfect for cookies (oh yeah! 😉 and they slide right off the sheet, this sheet can also be used for stove top cooking by simply placing and molding it to fit the shape of any glassware, frying pan, bottom of the oven, etc. Basically, it’s quite the versatile and helpful tool. It has been FDA approved and the proven technology is used by many restaurants over the world, especially Europe. 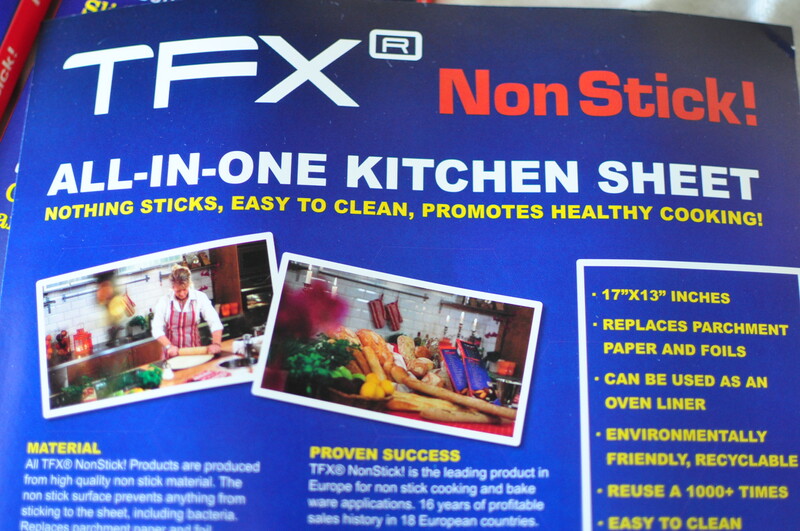 Would you like to try the TFX NonStick All-in-One Kitchen Sheet for yourself? Cool, cause this giveaway is for you! Leave a comment telling me what you would use the kitchen sheet for first? Like my Facebook Page and leave a comment telling me your FB name. Subscribe to posts via email/RSS and leave a comment telling me you did. Giveaway is open until Wednesday, May 30th. Winner will be chosen by Random.Org and will be announced that Thursday. Cool giveaway! I’d probably use this for everything- baking cookies, casseroles, you name it! I am constantly using parchment paper and feel really bad about it sometimes. I would love to bake some fish on that! I would use it for cookies! I love this idea! I would use it for everything I bake because my pan isn’t in the best shape but it still works! I would use it for baking, probably cookies! Very cool product! I immediately thought of vegetables and fish. Cookies sound great too. I would obviously use this for cauliflower pizza first! I’ve been wanting to eat it but it always sticks to the pan! omg I need to make some! definitely, definitely cookies. 🙂 probably those oatmeal cookies you made a couple posts back- they look killerrr! Can you tell me where I can buy this product? Is it available online? It looks amazing!